Observations of the Earth’s exosphere have unveiled an extended envelope of hydrogen reaching further than 10 Earth radii composed of atoms orbiting around the Earth. This large envelope increases significantly the opacity of the Earth to Lyman α (Lyα) photons coming from the Sun, to the point of making feasible the detection of the Earth’s transit signature from 1.35 pc if pointing with an 8 meter primary mirror space telescope through a clean line of sight (N H < 1017 cm− 2), as we show. In this work, we evaluate the potential detectability of Earth analogs orbiting around nearby M-type stars by monitoring the variability of the Lyα flux variability. We show that, in spite of the interstellar, heliospheric and astrospheric absorption, the transit signature in M5 V type stars would be detectable with a dedicated Lyα flux monitor implemented in a 4–8 m class space telescope. 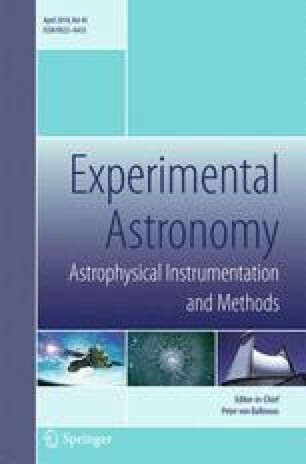 Such monitoring programs would enable measuring the robustness of planetary atmospheres under heavy space weather conditions like those produced by M-type stars. A 2-m class telescope, such as the World Space Observatory, would suffice to detect an Earth-like planet orbiting around Proxima Centauri, if there was such a planet or nearby M5 type stars. A correction to this article is available online at https://doi.org/10.1007/s10686-019-09619-x. This work has been funded by the Economy, Industry and Competitiveness of Spain under grant numbers ESP2014-54243-R and ESP2015-68908-R.